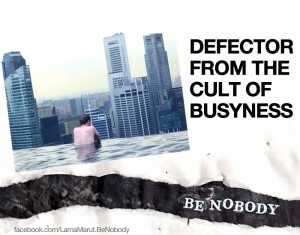 I thought it would be a propos to give a talk on the “cult of busyness” in New York City, the adrenaline capital of the world as part of the summer, 2014, “Be Nobody” book tour. This is an extract from that talk, given at Ava Gerber’s “Lucky Lotus” yoga center in Fort Greene, Brooklyn. Part of the culture of narcissism and self-centeredness we live in includes the idea that the self will improve and magnify itself through constant activity. We hope that by just staying busy all the time, following the inner compulsion to accomplish, we will become bigger and grander somebodies. The irony is that it wasn’t supposed to be this way. In the 1960’s, experts were predicting that with the widespread introduction of labor saving devices, we would all have much more leisure time. Instead, it has turned out to be just the opposite. Not only do we on average work longer workweeks than ever, our jobs have encroached on our dwindling time off. Employers expect to be able to reach us on our smart phones and computers nights and weekends, and we dutifully keep our devices on all the time in order to be available. We’ve interiorized the idea that there is a correlation between busyness and importance, that staying busy all the time is somehow a sign of the value of our lives. We’ve lost the fine art of just doing nothing – and of being nobody – and we need to regain it if we are to survive the times we live in.